My good friend Mark Jones, who is doing his PhD alongside me on Thomas Goodwin’s Christology at Leiden University, has noted that the work of the Spirit in the pactum salutis is an area that still needs to be explored in PhD work here. 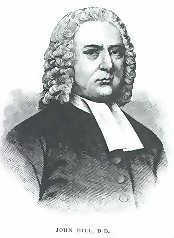 Now Mark knows that the grand Particular Baptist theologian John Gill (1697-1771) is one of the few who have made a contribution in this regard. Richard Muller, has noted this contribution in his article, “The Spirit and the Covenant: John Gill’s Critique of the Pactum Salutis,” Foundations 24 (1981): 4-14. I would suggest any pursuing the idea of the Spirit’s role in the pactum salutis check out Muller’s article and the go directly to the source to Gill to see how he approached the issue. Mark is right, it is an area that needs to be explored. Let’s not forget our Particular Baptist brethren though as we look at this issue. Often scholars fail to see the Baptist contribution to Reformed thought. Muller, has argued that Gill carries the 17th century Reformed legacy into the 18th century (see his “John Gill and the Reformed Tradtion: A Study in the Reception of Protestant Orthodoxy in the Eighteenth Century” in Michael A. G. Haykin, ed. The Life and Thought of John Gill (1697-1771): A Tercentennial Appreciation [Leiden, Brill, 1997]). Let’s not forget that! This entry was posted on Monday, May 5th, 2008 at 9:24 pm and is filed under John Gill, Reformed Theology, Uncategorized. You can follow any responses to this entry through the RSS 2.0 feed. You can leave a response, or trackback from your own site. I’ve added your blog to my rss reader just under Thomas Goodwin. I was attracted to Mark’s blog because of his posts on Eternal Justification. It was refreshing to read someone who didn’t label John Gill an antinomian heretic. Now that you have given notice there will be more posts on Gill you’ve gained another regular reader. He’s been one of my favorites for many years. I agree with your statement on going directly to the source when trying to understand Gill. He seems to be greatly misunderstood today. Yes, the primary sources are always essential! I am glad to have found a new reader! I hope to be faithful to Gill as I explore him both on here and in my PhD.